Country living at its best! 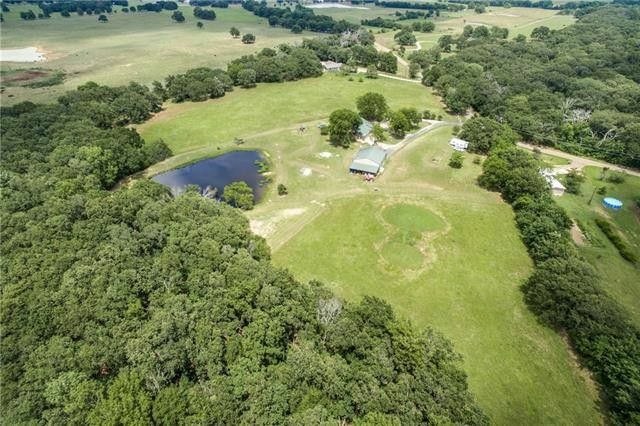 Custom home on 13+ acres, stocked pond & 40x36 shop. Circle drive connects house to workshop & attached apartment. Covered porch leads to3-2-2 home (1860 sqft-per appr). Living room has stone fireplace & access to covered back porch w-views of stocked tank. Kitchen-SS appliances+pantry, with pull out shelves. Workshop is (aprox 1200 sqft) partially Air Conditioned. Shop can be game room, or “Man Cave”. Upstairs storage in shop & covered area outside. Recently remodeled efficiency apartment attached to shop w-stained concrete floor, kitchen & full bath. Property is zoned agricultural-partially cultivated hay field & includes RV hook ups (H2O & elec) & additional barn near tree line. Directions: From Dallas, traveling East on 30, to exit 142, County Line road. Go left over highway and turn right, east on North service road. Drive past rest stop on right and turn left onto CR 1014. House is up on left. Sign in front.